This PhD research project aims to improve the understanding of complex wave phenomena in seismic imaging by taking advantage of increasing access to high performance computers to perform complex computational modelling. In particular my research focuses on seismic wave propagation in rocks containing multi-phase fluid distributions and imaging beneath seafloor canyons. 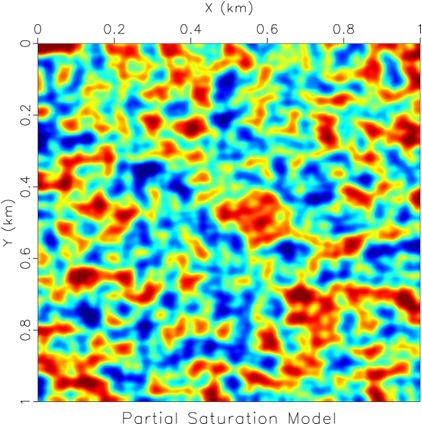 In this project we will simulate seismic wave propagation though elastic scattering models of partially saturated rocks to increase our understanding of the effect of multiple fluids. In the past this phenomenon has rarely been investigated using computational modelling or elastic scattering models. Seafloor canyons present another complex wave propagation effect that has yet to be fully understood. Significant data has been collected over seafloor canyons, but research into how to image seismic data obtained in such an environment is currently ongoing. We will undertake one of the first projects to apply full elastic, three-dimensional seismic wave simulation in earth models containing seafloow canyons to increase understanding of how to process and image seismic data containing such geological structures.Anisotropy presents another complex wave phenomenon that has yet to be fully understood. Significant research has been done to understand the seismic effects of anisotropic media, but research into how to image seismic data obtained in such an environment is currently ongoing. We will undertake one of the first projects to apply full elastic, three-dimensional seismic wave simulation in earth models containing horizontally transverse isotropy (HTI) to increase understanding of how to process and image seismic data containing such effects. In the past it has been sufficient to model the subsurface using approximate fluid properties and the assumption of relatively flat seafloor at exploration seismic wavelengths. However as the more easily accessible reservoirs are exhausted the oil and gas industry has moved to producing deeper and more complex resources. These less accessible reservoirs require more accurate modelling and imaging to explore, find and produce energy resources. This includes more accurate modelling and interpretation of the effects of multi-phase fluid distribution and complex seafloor topography.